This super simple recipe for red and white tortellini uses just five ingredients and takes just five minutes to put together. We've served it to ​company - it's that good! This is one of the recipes that we use when we're too tired to cook and just don't want to face the kitchen anymore, but don't want to leave the house. We often add a one pound bag of frozen fully cooked meatballs to the casserole; just put them on top of the tortellini and bake as directed. If you want to keep this recipe vegetarian, just use vegetarian meatballs! Or you could saute some onion, garlic, and bell peppers in a bit of olive oil before mixing with the tortellini and sauces. But that would make this recipe more than five ingredients! And this recipe is really perfect just as it is. We like to serve this recipe with a nice crisp green salad tossed with some fresh sliced mushrooms and some cubed avocado or cherry tomatoes. A fruit salad would also be delicious with this super simple dish. For dessert, offer some ice cream, drizzled with chocolate sauce and caramel sauce, and topped with toasted pecans, for the perfect end to this easy but wonderful meal. In a three-quart glass baking dish, layer the frozen tortellini and the spaghetti sauce. Put the water into the empty sauce jar, close the lid tightly, and shake well. Pour this mixture over the tortellini. That's how you get all of the spaghetti sauce out of the jar, and the water helps the tortellini cook and stay tender. Spoon the Alfredo sauce over the tortellini, making sure that all of the little pasta is completely covered. Place the milk into the empty Alfredo sauce jar, close the lid tightly, and shake. Then drizzle this mixture over the casserole to get all of the sauce out of the jar. At this point, you can top the casserole with frozen meatballs, if using. Sprinkle with the cheese. Cover the casserole tightly with foil and bake at 350 F for 55 minutes. 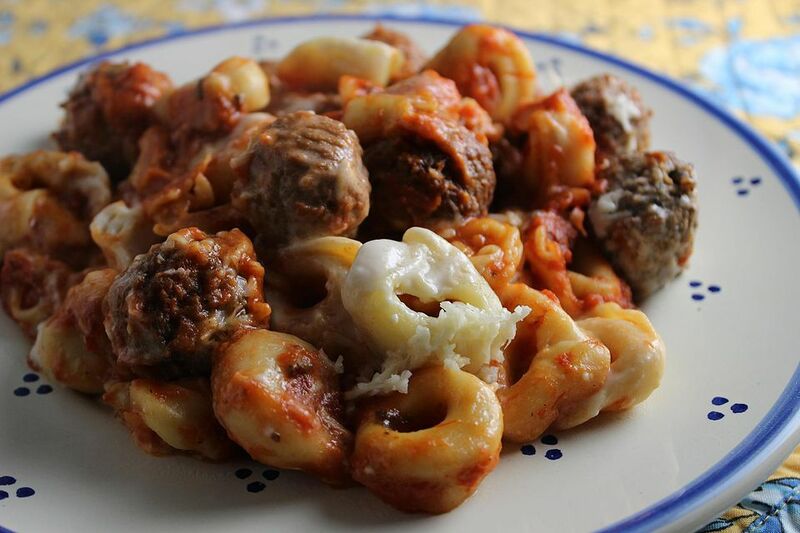 Then uncover the casserole and bake for 10 to 15 minutes longer, until the tortellini is tender, the sauce is bubbling, the cheese is melted, and the meatballs are hot. Meatloaf Spaghetti Is a Perfect Way to Secretly Use Up Leftovers!